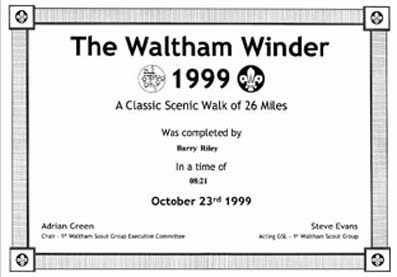 The Waltham Winder I will always remember as being the probably most boring long distance walk I have ever done. I suppose the problem is that once you go to the east of the M1 anywhere between Nottingham, or there abouts, and London the land is generally flat. It even makes Warwickshire seem hilly, or at least this bit did. Maybe sometime in the future when the hills of the Peak District become too steep I’ll enjoy the flatness to the east. But I digress. The Waltham Winder was started some years earlier as a way of raising funds for the clock of a local church. Once sufficient money was obtained - that’s the official reason - the event was discontinued. However, it was later reintroduced by the local scout group, the 1st Waltham, and both Mick and I were tempted when it was described as a "Classic Scenic Walk of 26 miles". Well it was a walk and it was 26 miles but I have reservations on the appropriateness of the two adjectives used. We reached the car park for the walk, located in a field just to the north of the village, and as it had been raining overnight we quickly made our acquaintance with the local mud. We were to see quite a lot of it in the next few hours. From car to walk start. Check in. Very efficiently done. Outside ready for the "Off". And we are away. We had been told no maps were required, so I suppose we had expected it to be signposted the way the "Chatsworth Challenge" is. Wrong. All walkers were given a "Route Description" detailing where they should go. A sample of this is given below. it was not suitable for the task ahead so we let the group discuss which way they should go. Once they had made a decision we followed them and, having by now improved our mud wading techniques, we were able to keep up with them, which we did for a few more miles. I suppose the directions weren’t really that bad. However, when we were on our own again we really had to concentrate as we knew once we took a wrong turn it would be difficult to get back on course.The certificate for completing the Waltham Winder. NB. We covered the 26 miles at a speed slightly quicker than one mile every 20 minute - but there were no hills. While writing this I am looking at the directions trying to remember parts of the walk. I can remember going down to the 1st check point, which was under a disused railway bridge, and walking through the railway cutting, that was badly overgrown, and about ½ a mile further on meeting a competitor running towards us looking for his watch which he had lost. Thirty minutes or so later he passed us with a wave and with his watch, which he had found in the cutting. This was probably the highlight of the first 6 miles. The 2nd check point was the Village Hall at Long Clawson and the next checkpoint was at Grimston. At one of these check points we were fed and watered. And how we were fed and watered. Without doubt we were better fed and watered than any other walk I have ever been on. Tea, squash, coffee, sandwiches and cakes in abundance. Usually on a long walk I will shed 4 or 5 pounds, which unfortunately I will soon put back on again. There was certainly no chance of this happening on the Waltham Winder. I remember taking care going through a field of cows. Was there a bull amongst them? We weren't sure and didn't linger to find out. I remember going up a small rise, which, I understand, was called a hill in these parts. Other than that the day seemed to consist of looking at directions, wading through mud, walking along roads and eating. Yes, there was plenty of eating. Since 1999 the Walthem Winder has improved considerably. There are now three routes of 26, 16 and 10 miles in length, all are very well marked and the food continues to be excellent. See other pages on this site for details of the 16 and 10 mile walks.